Mohanji in Wayanad : Fruits of a long wait! We met Mohanji at the Bangalore airport to end one and a half years wait to bring Him to the southern part of India especially to God’s own country, Kerala. We were racing to make it on time as the traffic delayed us by an hour , and it turned out that we were at the arrival gates the very moment he came out of the airport. Vineeta and Preeti were there before us. Vinita greeted us with a wonderful lunch at their guest house. 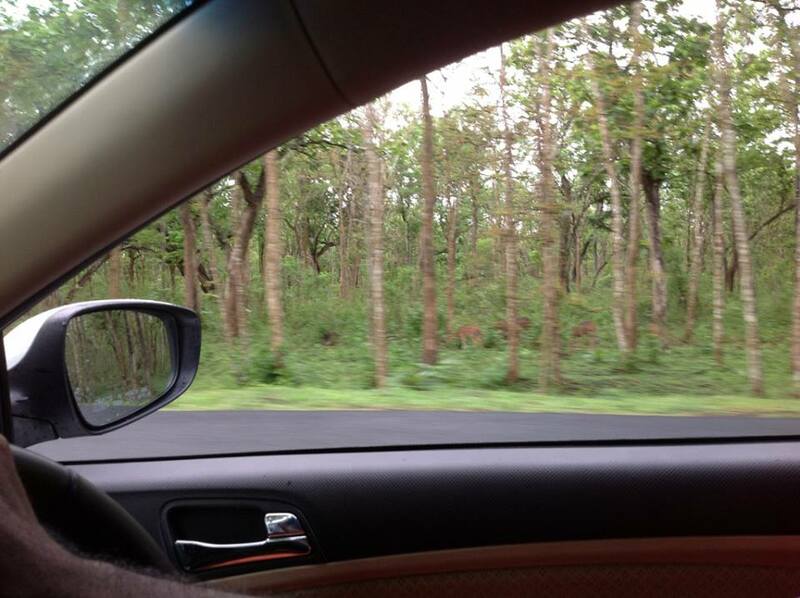 We were then ready for a six hour long drive to Wayanad, one of the spectacular northern regions of Kerala. It was late night when we reached Meenangadi, where MohanJi stayed for the rest of the trip. 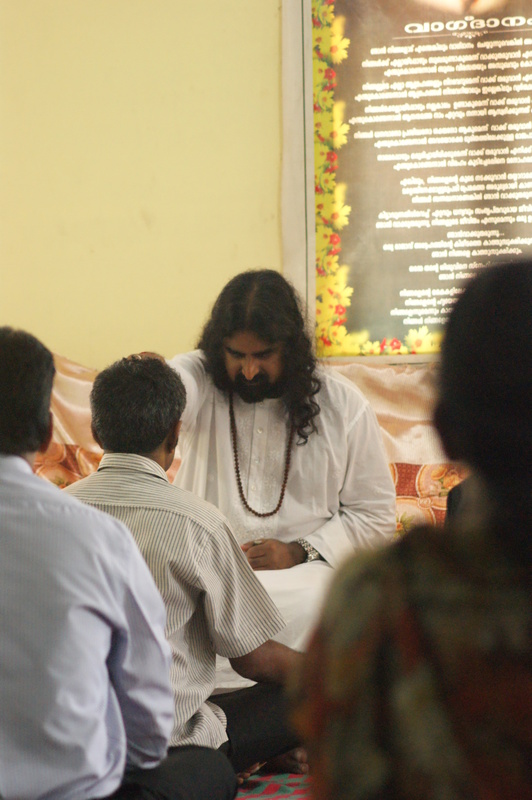 We organized the first ever ‘Power Of Purity Meditation’ in Kerala followed by a satsang and Shaktipath. More love was showered on us the next day when Mohanji was invited to the houses of His devotees. 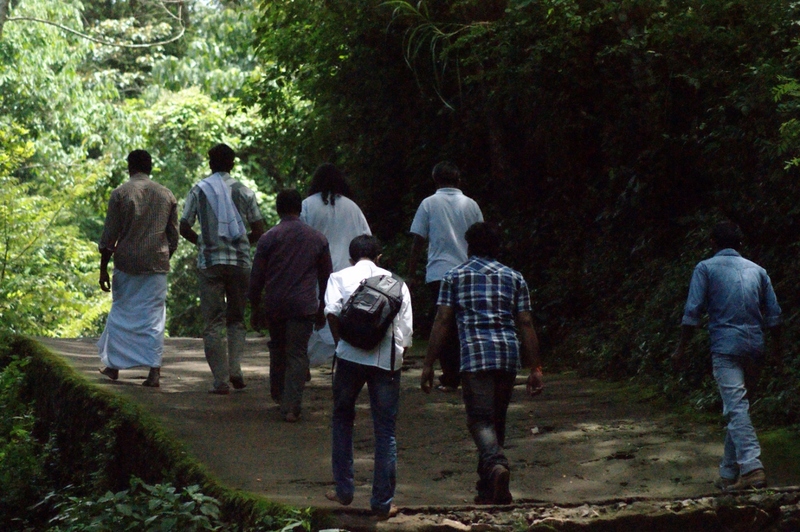 We got the opportunity to visit some beautiful pilgrim spots in and around Wayanad with Mohanji. 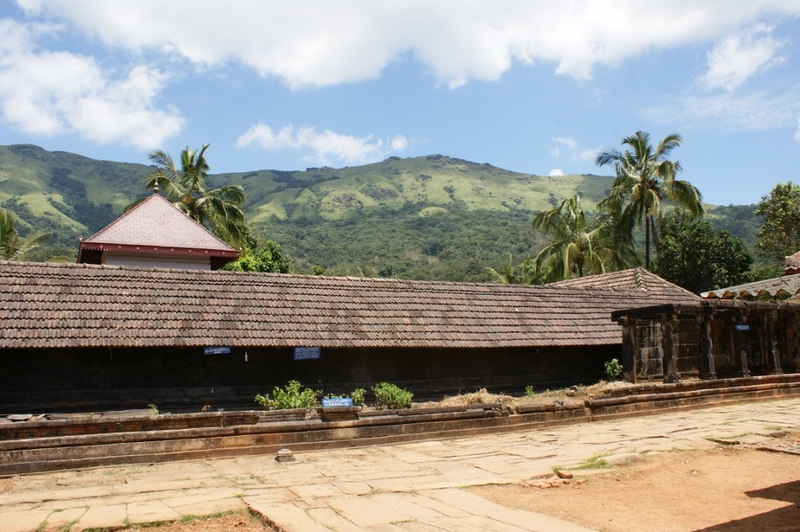 A place worth mentioning was Thirunelli temple , which is known as the Kashi of the South . Mohanji said that its one of the powerful temples in Kerala and we truly felt that. There in the lap of nature, the energy in and around the temple was tremendous. 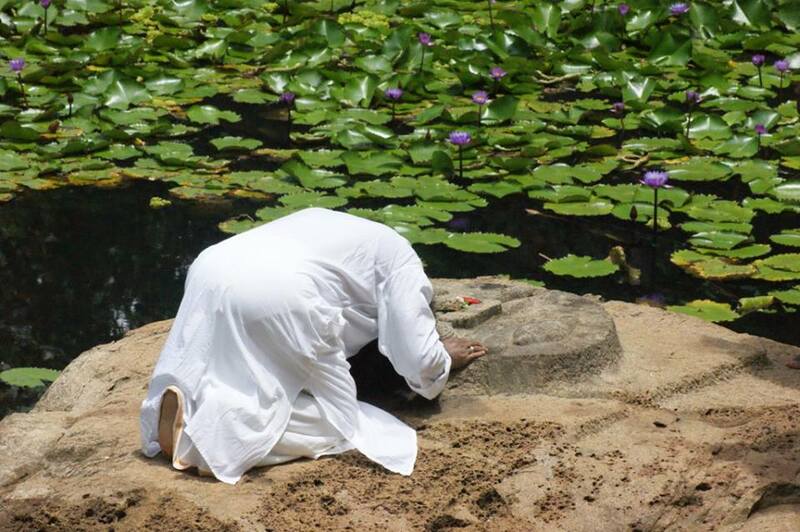 Here is a picture of MohanJi prostating at the ‘feet of Lord Vishnu’ surrounded by Lotuses. 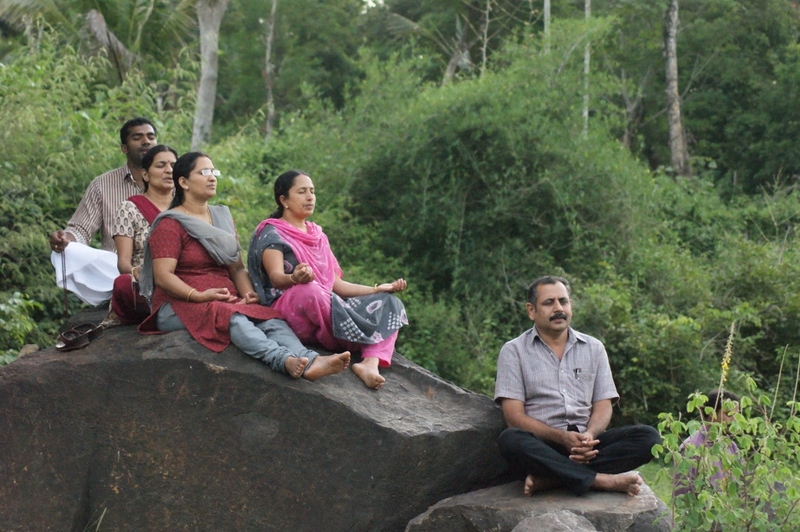 Then we moved on to Ayurveda Yoga Villa , which was a serene river side ayurveda resort , where we decided to stay overnight absolutely falling in love with the place. In a few hours we understood that the stay was predetermined as everything was falling in place, and in just a few minutes a satsang for the people at the resort was organized leading to a Homa in the morning and a POP session a while after. It was worth mentioning that the management and staff were exceptionally helpful and the requirements were provided . Mohanji expressed his gratitude and willingness to have a retreat every year in this beautiful resort! 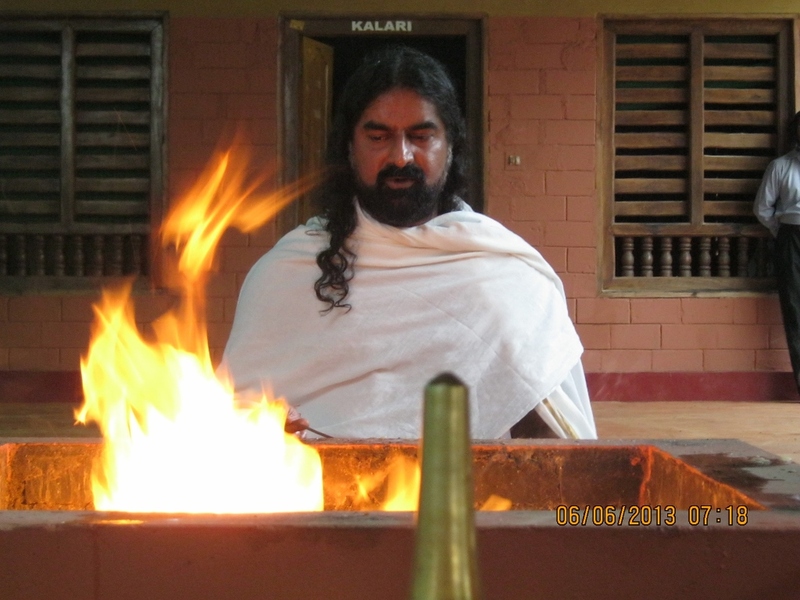 The homa we performed in the morning cleansed the Karma of people who have offered it onto the fire along with a coconut. 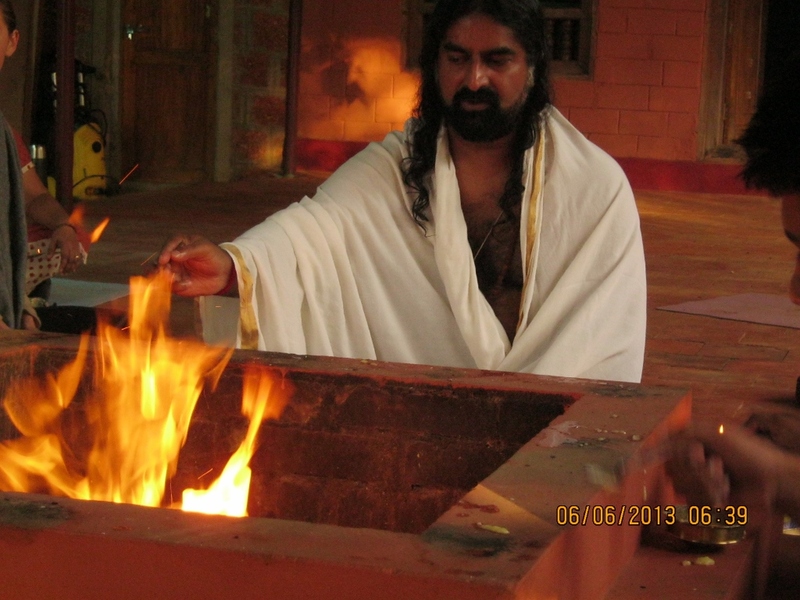 The fire clearly showed the presence of entities during the homa. 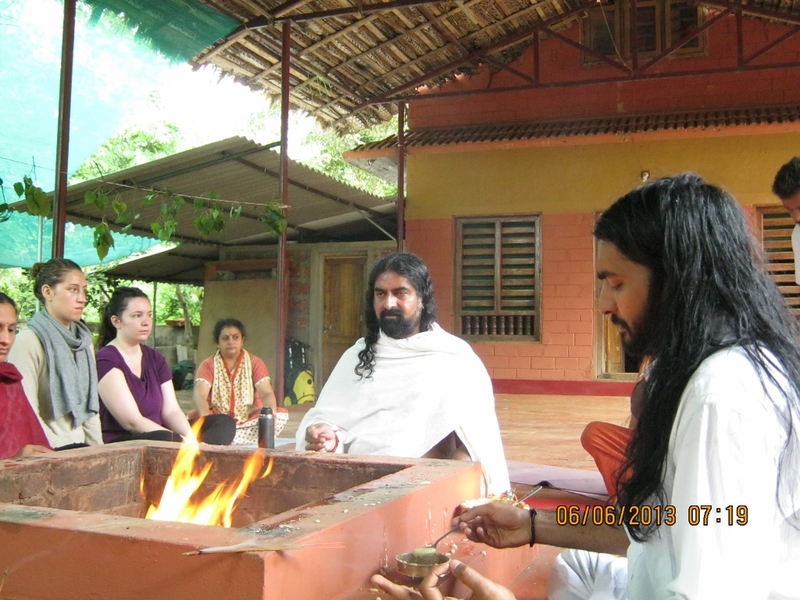 We took the monsoon showers with us as we moved on to the next destination which is an island temple called Kottiyur. This is supposed to be where Daksha performed his Yaga or fire ceremony, where his daughter Sati, the wife of Shiva burned herself in the fire. Shiva became furious. Shiva’s army came and destroyed the whole yagna. 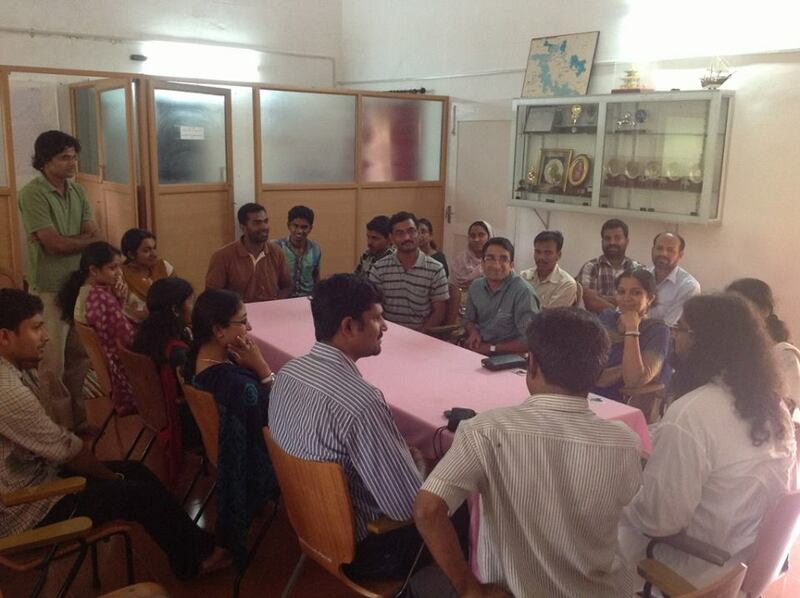 On 7th, a program was organised at M.S.Swaminathan Research Foundation, a Community Agrobiodiversity Centre , which included a farm tour , and an interactive session with the scientists and staff. They also honored us with a delicious lunch. As our journey grew more interesting we were all started feeling the lightness & inner peace of the ‘Mohanji consciousness’ which is pure consciousness itself. Each one realised in their own way that Master’s life itself is His teaching and how lucky we were to spend this time with Mohanji. 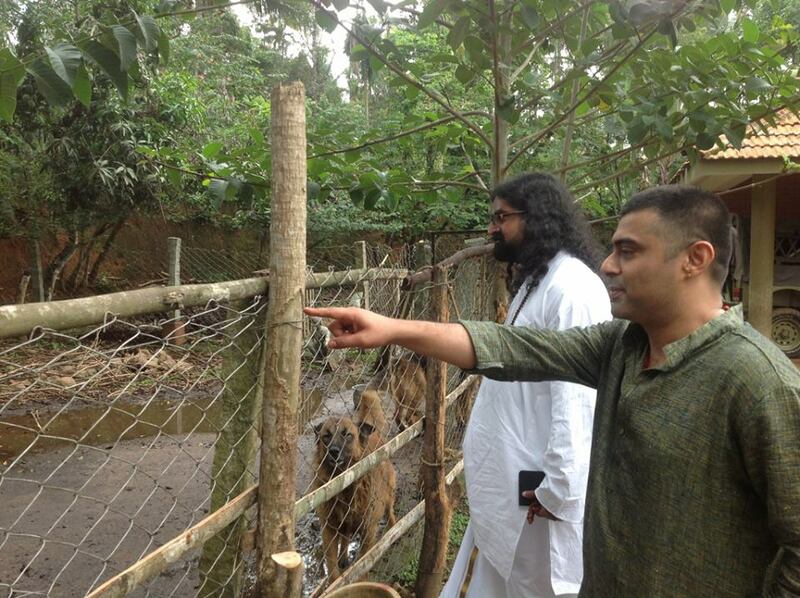 On the 5th, we took our time to visit an ardent animal lover , who is taking care of an indigenous breed of cow, known as Kasargode Dwarf. He is on a dedicated mission to save and propagate the breed. 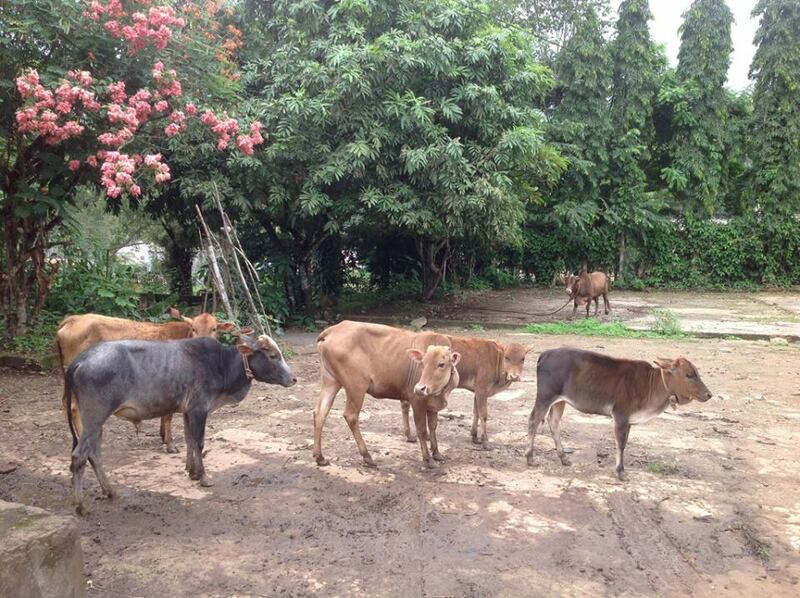 Mohanji intends to bring the indigenous Indian breed of cows and bulls into His ashram at Wai! 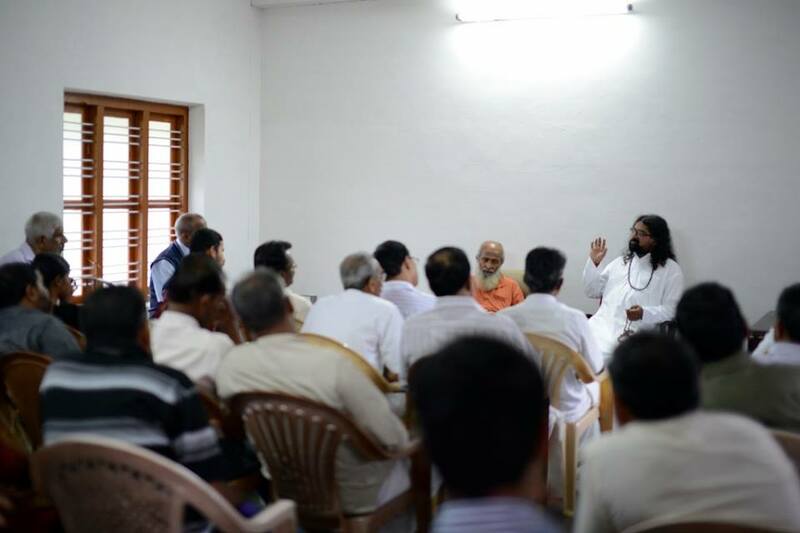 In the evening we had a special program along with Dr.Raman (a retired professor, and consulting dermatologist, and a motivating spiritual master or according to Mohanji – a ‘true yogi.’) who introduced MohanJi to the seekers from all walks of spirituality. Satsang was followed by the much awaited book release , Mohanji’s first ever book in his native language – Malayalam. 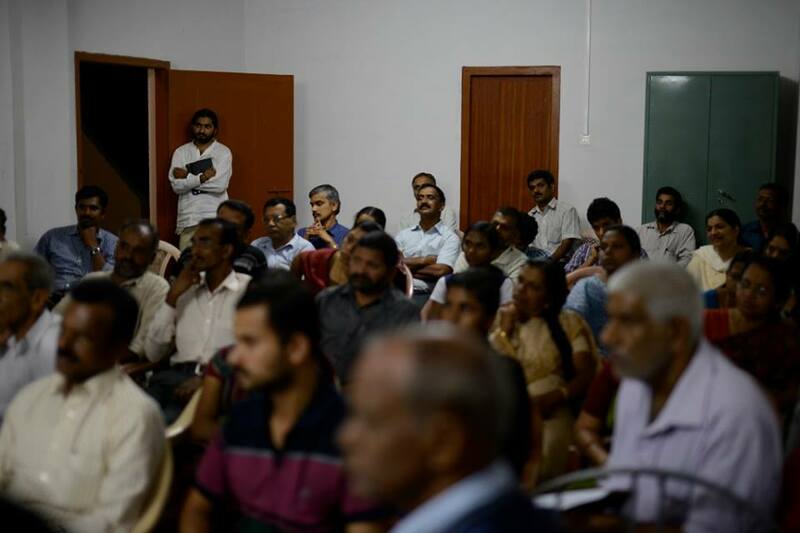 Audience for book release Malayalam translation of ‘in search of the precious’ . The book is a translation of Mohanji’s ‘In Search Of The Precious’ translated by Dr.P.K.Namboothiri. Dr.Raman released and handed over the first copy to Dr.Padmanabhan. M.D. 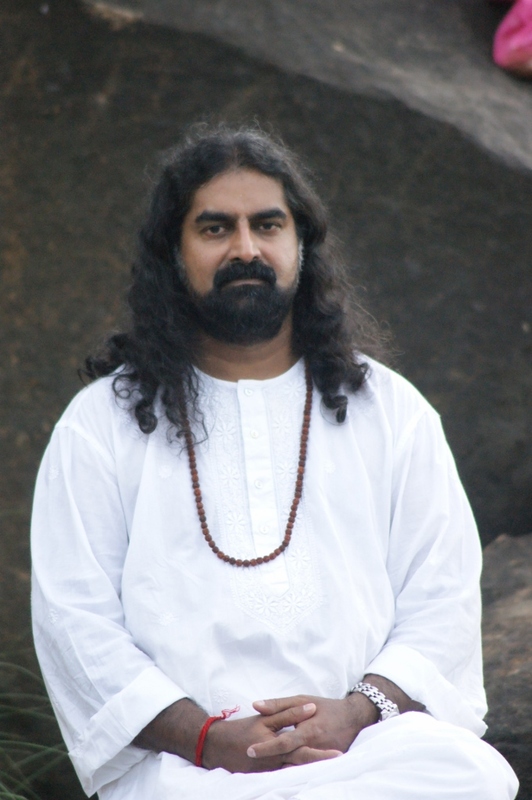 Ayurveda, retired DMO. Mohanji expressed his sincere gratitude to the whole team who made this possible. Gratitude is extended to Prof. Sadasivan, Dr.Padmanabhan, Dr.Raman, Anand Padmanabhan, Madhusudanan Nair, Beena Sadasivan, Uma Madhu, Ajitha Padmanabhan, Ajay Krishna, Santhosh, Ajay, Sabu Adithyan, Dr.Sanjeev , Dr.Krishnadas and many more. Mohanji loved the place and the people. He looked forward to return every year to this enchanting place. With a deep senses of satisfaction, of a job well done, we set a mile stone in the spiritual life of many. Our Journey now takes us to the north…. We shall talk about it in the next blog. “Nature’s Fury : Estimation of 200 plus missing or dead. More than 40,000 people stranded on roads in Uttarakhand. 200 two-wheelers and about 100 cars washed away. Cloud bursts. Bridges broken. Roads washed away. Children,women and men have no food, shelter or medicines. Army is trying their best to reach people. Lack of roads are preventing the rescue operation. Even the Helipad in the neighbourhood of Badrinath is not operational. It is freezing cold and rains are continuous. People stranded in Hemkunt Sahib as well as Badrinath. Even the police post at Kedarnath is totally washed away. We at ITBP guest house at JoshiMath, 8000feet above sea level, are safe. Water and Power supply is lost in all the ITBP guest houses. Rains help with cold water. Electricity is partial through generator. Phone connection can go anytime. Bharti Kapoor announced it to Bless The World Family and Ammucare Caritable Trust responded with rocket speed: “Bless the world Family Members are already working on ,with the ITBP i.e. Indo Tibetian border Police and airlifting stranded old-aged and kids . Meanwhile Bless the world Family are collecting the stuff and shall send across to ITBP directly, the needful once the transportation starts. (Disaster Management) have joined hands with us to do the best for all people out there.!! Ammucare Charitable trust is a registered non-profit organization in India and has been involved in seva projects for more than a decade. Every year Ammucare manages initiatives across India in various fields including blanket distribution, annadaan (food seva), blood donation camps, women empowerment programmes and human rehabilitation. Ammucare believes in acting fast and acting now. And even for the current calamity at Uttarakhand, we are using all the available resources and contacts to ensure that the help reaches the needy as soon as possible. Clearly, the objective is one, whether it happens individually or from an organized association. Announcements, collecting and distributing items started. Mohanji has been constantly a source of uplifting the hardworking and super dedicated soldiers of ITPF and conducted Power of Purity Session for them in Jyotsimath, Uttarakhand on 19th June 2013, at 6.00 am. This was to alleviate the stress of these hard-working selfless men who have been working day and night to rescue and rehabilitate the stranded people at Uttarakhand. 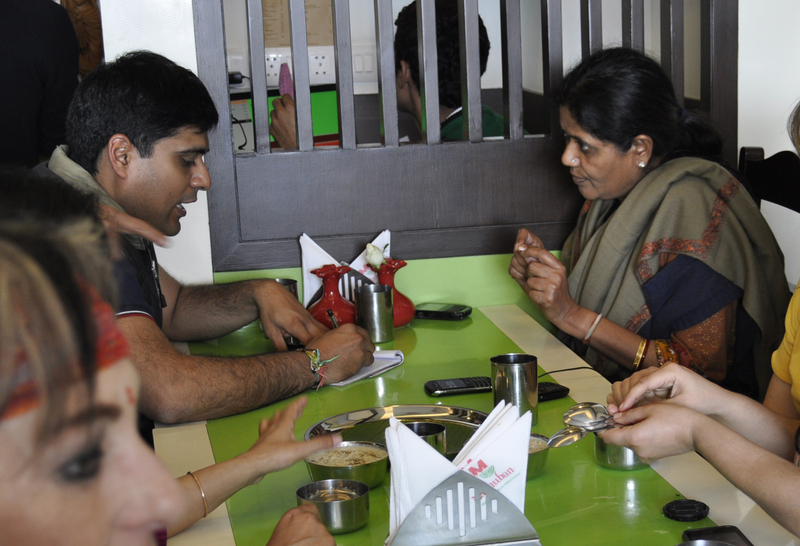 Below is the first hand narration by Sumit who has been travelling with Mohanji for this trip. “Rain took leave from last night. Mohanji told us in the morning of yesterday, looking at the overcast skies and heavy rains that the sky will clear by the evening and winds will take the clouds away. It happened. Sky cleared. Rain stopped. But not before it unleashed the wrath which took many lives and devastated the land. We got out of the rooms to see the Saptrishi stars in the sky and dazzling half-moon. When we entered our accommodations in the ITBP guest house, Mohanji had said, we may not be able to travel further north than this. It seemed prophetic. As the sky cleared today, the selfless soldiers of ITBP could rescue much more people from the Gobind Ghat area. Almost 300 people were brought to this camp and were given food and shelter. Most of the key officials visited Mohanji in our accommodation. Mohanji delivered shaktipat and discussed various options with them. Most of all, he appreciated their tenacity, work ethics and determination. He volunteered to join them in the rescue operations. But, the pointed out the extreme cold temperature and high altitude need trained personnel to do such operation. One needs practice in rope climbing and walking on fragile terrains. The supplies were less as the mouths were more. Mohanji sent out message on Facebook – We are fine, we are protected, but cannot sit idle. We must do our part in such a crisis situation. As skies cleared, helicopters started appearing and the commander discussed the possibility of evacuating VIPs in helicopter to a safe location. We must do our part in such a crisis situation. Mohanji categorically refused to be considered as a VIP. He suggested evacuating the sick and old first, women and children next and others including us later. The commander was surprised at this. The soldiers were showing extreme respect for this consideration. They changed our rooms, close to the food area. Today, we went to the market and sourced flour rice, vegetables, sugar, etc. and delivered to the soldiers. Our humble contribution and seva. The Commander-in-chief, took Mohanji and us to the houses where the affected were accommodated and we spoke to them. They explained the situation they faced, the people they saw washed away, vehicles destroyed and taken away by flood, land eroding in front of their eyes, etc. It was indeed a grim tale. We realized how lucky we have been to be accommodated and respected in such a scenario. Whole of Kedarnath has been washed away. Estimated 5000 people are stranded at Badrinath. The only good news for us was that the road until Rudra Prayag is fine as of today. Cricketer Harbajan Singh is also a guest here. He asked Mohanji when he intended to leave. Mohanji jockingly said “when you leave”. This means when we can travel safely to Delhi. International cricketer Harbajan Singh listens attentively while Mohanji talks to the commandant of ITBP. The commander in chief, Mr Praveen Tiwari, came with his family and met Mohanji in the evening. He requested Mohanji to conduct Power of Purity meditation for the soldiers who are under tremendous stress. He immediately agreed. So a special session for soldiers is being organized today at 6 am. The Indo-Tibetan Border police is a classic example of selflessness and tenacity and their hospitality in such adverse situation is tremendous. This is the update for the day. Our phones and internet are either slow or not functional. Hence there is lot of problem in communication. We anticipate at least 2000 deaths, even though the official figure is 60. The eyewitness account of today itself estimates to 1000 deaths. The usual rainfall is 65MM, and it became 313MM in last two days. We are here for a reason. Mohanji is here for a reason. We are here for a reason. Mohanji is here for a reason. The deputy commander and his family visited us and said that they are missing Mohanji already as we were moved to new accommodation. This is magic. Bliss in the time of tragedy. Whatever we do seems insufficient. We are doing whatever we can. Kindly do whatever you can also from your end too. Initiated by Annette adamson, supported by Smriti Arora and others, Bless the World Family joined hands for a group prayer for all the suffering in this natural disaster. “You know who really gives the thoughts…who really is behind the acts!”, says Smriti. “Sending love to you all, we’ll be with each other in spirit tonight at the same time across the globe. Tons of blessings! !” says Annette. We are together in spirit, we are one. In spite of best efforts by local authorities, there is need for even basic amenities like food and shelter. 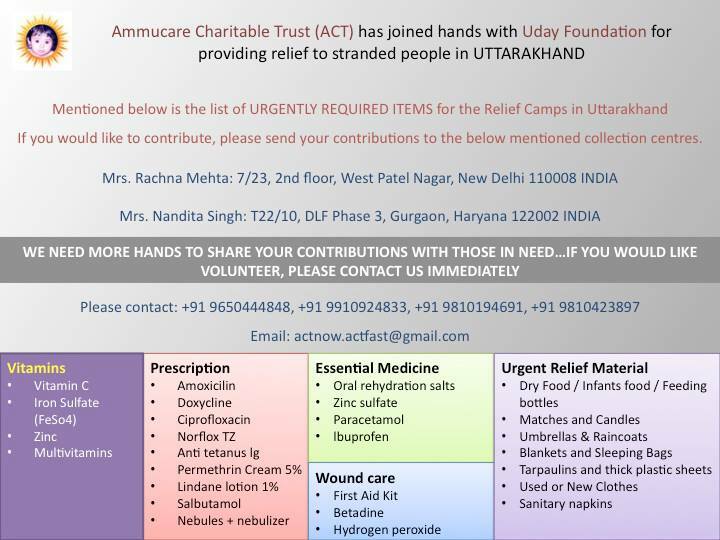 Ammucare Charitable Trust (Ammucare) has joined hands with Uday Foundation, New Delhi, India for providing relief to stranded people. Their volunteers are ready for rescue and relief work and they are in the process organizing emergency health camps and sending relief material. “Blessings to All. Thank you for sharing the beautiful pictures. It is only Grace that Mohanji is there in that place in this very crucial time. Let us all also pray from where ever we are to add to the Collective Consciousness of His work and prayers. Let’s send Love and Light to Mother Earth to add to Mohanji’s work, as she needs it more than anything and only then will doors and help open up more and more. Somewhere today morning, it came to me to share this, that its so important that We bring GOD into our Everyday Life and not behave carelessly all throughout and then just go to HIS Abode to ask for Forgiveness or wash our Sins. In that way it is taking HIM HIS Creation (nature humanity) for granted. HE is the all Loving and We need to shift from being GOD Fearing to GOD Loving. If and when we do that, and bring GOD in our everyday Lives, by doing our duties, loving all around us, not gossiping, slandering, discriminating, helping less fortunate or not holding hurts and grudges, being unconditionally forgiving, releasing unwanted desires at HIS Feet, etc. then we will create less negative Sanskaras and therefore not dump our negative Karmas unto Mother Earth. The gravitational force of the Mother Earth absorbs our negative Karmas and Sanskaras and when that gets overbearing for HER she releases it out with magnanimous Fury. Mohanji giving meditation Power of Purity to relieve stress in soldiers in Uttarakhand. He admires their tenacity and work ethics, they worked day and night to save the flood victims. So let’s awaken please to the GOD within each of Us and not keep seeking HIM outside of us. HE is very much dwelling in the Temple of Our Soul. We are not this Body, we are the Spirit in the Body and that Spirit is the Fragment of that ONE GOD the Creator who we mindlessly try to Search and seek outside of it. With the Grace of a Living Gracious One our Dearest Mohanji; let’s all March Inwards to the GOD within us and seek HIM there and thus see HIM in Us and in Everything and Everyone around us. God Bless All! Gratitude to HIM for placing Mohanji in that place right now. Because Mohanji is doing more than what meets the eye or that which we Read here or on updates. Gratitude to You dearest Gracious One! Love Light and Prayers to all victims, their families, the army, the helpers, volunteers and all involved. Bliss in the middle of sorrows. “Miracles are bound to happen where Masters walk. 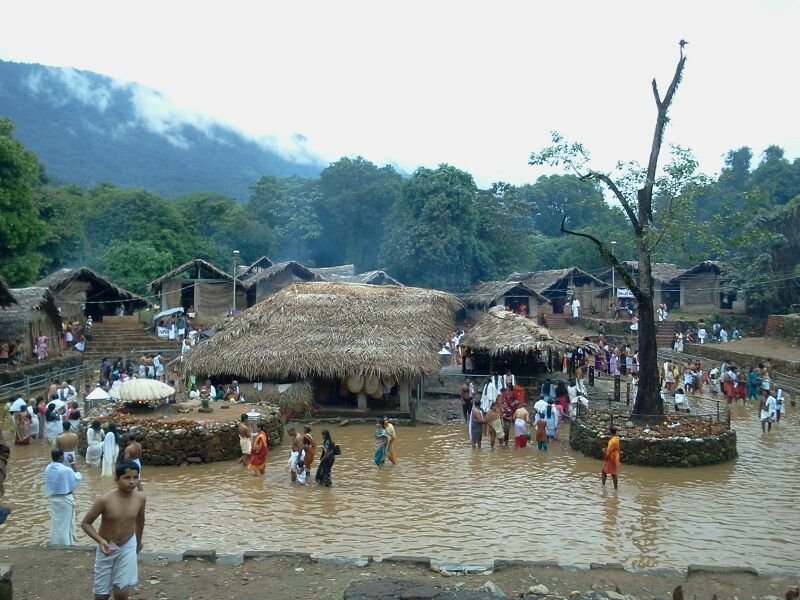 Mohanji had been warning us about floods,disaster and devastation. Here He is in the middle of a disaster and not only His conduct is exemplary but truly befitting of a Master. He always shows us the way and we must learn from this so that we don’t live our lives in vain. Thank you Mohanji. We are doing our best to help our fellow citizens. “ It’s amazing how Beloved Mohanji was concerned more about others than himself. Perfect, living example of being selfless. He walks his talk.” says Shahid Khatai. After our whirlwind time in Delhi, we had a few days “holiday”, and Daina, Bilja, Hein and myself decided to go to Rishikesh. Rishikesh is where Swami Sivananda’s ashram is, and tracing back to the origins of our Vibrionics system of healing. Swami Sivananda, guru of Swami Venkatesananda who in turn was the guru of Mataji Narayani. Mataji is the author and pioneer who created this particular Vibrionics course, which Mohanji (Baba) is reviving and going global with. I loved Rishikesh from the moment of arrival. It felt absolutely familiar, to the point where the thought crossed my mind to get a little piece of land there instead of in South Africa! Anyhow, the future belongs in the future…. That was also where Mother Ganga made Her beautiful face visible to us for the first time – that was amazing. She is amazing. Her water was freezing, but Hein went in all the way while my old bones protested and wouldn’t have it! I had a half-dip only! Afterwards there were folks selling a little container with flowers. Inside it, a gee candle that was lit and then placed on the River – a most befitting and lovely ritual. The Mother’s holiness was deeply felt. 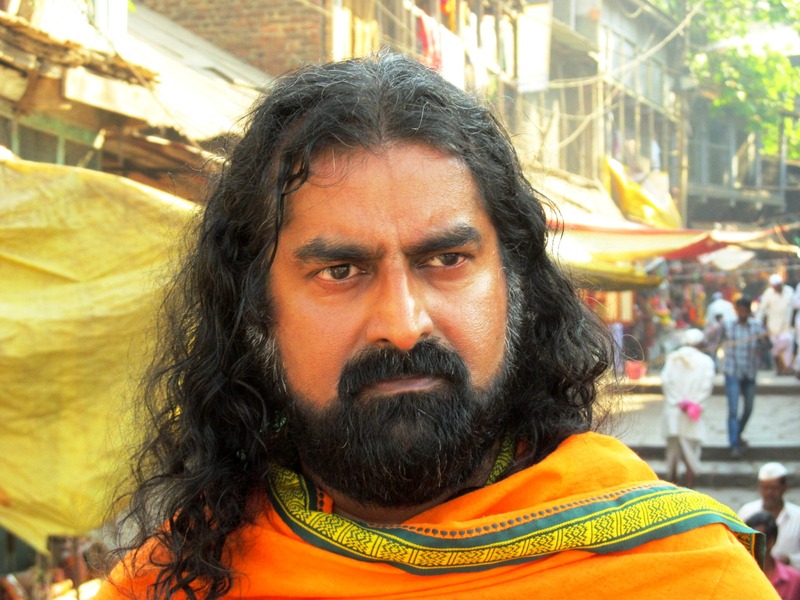 I never saw the more modern commercialized part of Rishikesh, I’m happy to say, but barring the Datta Tapovan, our Mohanji’s ashram outside outside of Wai, which is utter untouched paradise, I think Rishikesh would be my second choice of places in India….thus far. It so happened that Mooji was in Rishikesh at the time that we were there, so we attendended a few of his satsangs. That was an unexpected bonus. The satsangs were lovely. Mooji is a treat indeed. I had a wonderful experience while at Mooji’s satsangs. Mooji’s face kept changing, not vaguely or subtly, but absolutely (to my eyes). He kept changing into Mohanji, then back to Mooji, and when I look again, there is Mohanji; clearly. The teachings were the same as our beloved guru Mohanji’s teaching, obvioiusly, for truth is one, and merely delivered with different flavors, as each Master has His/Her own feel (slant), its a beautiful thing, to witness such a demonstration of oneness of all that is! The phenomenon of the changing of Mooji’s face into Mohanji’s, was a very pertinent message. At this juncture, I have to make an observation of how fickle the human mind is. Very recently I completely “fell” back into duality and was in complete turmoil – drawing comparisons between Masters and the likes (the absolute folly!!) – which caused so much unnecessary and absurd doubts and agonies – how hard the Masters work to rid us of these illusory notions, yet, how easily we forget what we’ve learnt and sink into the illusion of individuality, repeatedly, ad infinitum, ad nauseum – speaking strictly for myself of course!! We also met Mohanji’s Mataji, Vanamali Devi, at her little ashram in Rishikesh, a few minutes walk from our hotel. We met “other” Mohanji, a delightful gentleman who lives at Vanamali Devi Ashram and who was a wonderful conversationalist. The view from the ashram is indescribable. It looks down on the Ganges, and across from the river, the beginnings of the Himalayas are seen. We saw the sun setting over this magnificent view – again the timing was perfect! A fun train trip back to Delhi (we’ll avoid discussing public ablutions in India for obvious reasons, haha)! Another night at Nandita ji’s lovely home in Delhi, and from there we flew to Mumbai for another Vibrionics presentation. Namrata single-handedly arranged this vibrionics presentation at a most suitable, comfortable and lovely venue. In Mumbai we met lovely shy Namrata Rajgarhia. We were dropped of at the hotel to freshen up. We had a magnificent view of the Krishna temple – perfect. We were then invited for a magnificent meal at Namrata’s parent’s home. We thank Mr and Mrs Rajgarhia for their hospitality, and for also going to the trouble of attending our Vibrionics presentation. Namrata single-handedly arranged this presentation at a most suitable, comfortable and lovely venue. Thank you Namrata, a lot goes into arranging such a professional event. We had a fantastic attendance in Mumbai. I met delightful Shernaz and many other wonderful folks, including Dr Agarwal who is already deeply involved with Vibrionics. He was wonderful to speak to. We had an invitation to have a meal at lovely Shernaz’s home, but had to cut our visit in Mumbai due to circumstances. Another incredible surprise was to see our beloved brother Phaneendar at our Mumbai presentation. What an amazing gesture on his part to attend. Thanks to you Phaneendar and all the lovely people of Mumbai for a joyous though short visit. And we’re grateful for such intelligent interaction. Hein did all the demonstrations of the Base 44 machine and how the making of the remedies work. He did this with great aplomb at every location. After the presentation, Namrata and Hein went out for dinner. They had a lovely meal and according to Hein, great company! Thanks again Namrata for your hard work – it certainly payed off and we deeply appreciate your commitment and excellence. By this time, I had a raging fever which happens regularly – yet this was not a “normal” fever, this was fire. Something more was happening. However, it was decided that the best place for me to rest would be at the home of our sister Dana Rhadonic Bhandari. Well, that was indeed, and will always feel like a place of safety, rest and regeneration! One our first morning there, Dana strolls in, no make-up, no frills, no hair-do. That was the moment I knew we would get on like a house on fire. When I saw her doing her own ironing, I felt even more at home (if that’s possible)! Then there is lighthearted, fun and funny Ranvir Bhandari and his dog Nero. These two provided much laughter and entertainment in the evenings when Ranvir made his way home from work for dinner. Nero in his element (and out of his skin) that his master is home, and a delightful back-and-forth between Ranvir and Nero was a hilarious spectacle, much to our delight and much to the chagrin of our Dana, hehe. Dana was incredibly sensitive to our needs – gave us much time to rest and she gave us the run of the house. Their art and book collection is anyone’s dream. I spent much time perusing their paintings; a true joy for anyone with an eye for art! Hein couldn’t leave the bookshelves alone of course. All the while, our Bilja was working flat out on admin, filming and more! Nose in the PC, wow she is amazing and incredibly disciplined! All the while, our Bilja was working flat out on admin, filming and more! Nose in the PC, wow she is amazing and incredibly disciplined! Dana told us that we were to visit a saint who lives in Bangalore – Devi Amma…..its almost impossible to write about Devi Amma, about the bliss of sitting at Her holy feet! This was the second utterly blissful experience of the trip. She asked whether we had any questions/requests. I could find absolutely nothing to say except that She must please protect our Master, Mohanji (Baba). I gave Her a coffee mug with Mohanji’s face on – She loved it and SHE LOVES MOHANJI!! She promised to keep Him safe for us and predicted that much envy will be coming His way from now on, and that He indeed does need protection. I humbly request each of Mohanji’s devotees to also do what is necessary to protect Him. It was so hard to leave Devi Amma – I just wanted to stay forever…When it was time to depart, She chanted for us. I was on such a “pluck” when we left there, I don’t know how we got to the car. When I “came back to my senses”, we had arrived at Christel House, a school for abused and orphaned children in Bangalore for another presentation. What excellent care these particular children receive. A colorful and very loving environment. The children were very responsive and especially enjoyed Hein’s demonstration. One little girl came up to me and asked me to be her mother as hers had died many years ago…I can simply say to everyone, our planet is in deep trouble and despair. Our people and animals are suffering terribly. Now is the time to jump on the seva bandwagon and think less about ourselves and our little terrestrial families! Every living being is our family and its time to spread the love far wider than those whom we call “our own”. Everyone is us, and we are everyone. Sohum! Our final presentation in India was held at Dana’s beautiful home. It was an intimate and truly loving interaction. Everyone comes to mind, but I’ll mention two people in particular that linger pleasantly on my mind here. Mr Babu S. Rajan, a super intelligent gentleman who came up for a diagnosis (assesment). A very dignified and reserved man. Babu is a hypno-therapist and showed great interest in our Vibrionics studies. I felt a deep and longstanding familiarity with him, and for a suspended moment, there was a letting-the-guard-down and there was absolute openness. Such unexpected moments of trust is very humbling and beautiful and I thank you Mr. Rajan and sincerely hope you’re on board regarding the Vibrionics studies! Mr Babu S. Rajan, a super intelligent gentleman who came up for a diagnosis (assesment). A very dignified and reserved man. Babu is a hypno-therapist and showed great interest in our Vibrionics studies. Then there was dear Mr Deepak Mullick and his charming wife. Mr Mullick has had unbelievable physical suffering, yet, he walked up to me in such high spirits, and there wasn’t an iota of self-pity to be detected in this amazing being. He was making fun of his painful and damaged body and was so full of beans! He had had a massive stroke and many other physical challenges to deal with and was a tremendous source of inspiration for me personally. I thank you for that sahib! There was also Dana’s fashion designer friend, a delightful free spirit. To conclude (for the moment), Bangalore is a beautiful city – the trees there are breathtaking and the parks in Bangalore are also aesthetically very pleasing. To top all the “eye candy” in Bangalore, we walked on art in Dana’s home! Glass tiles with art below them! I kept on hopping, skipping and jumping to miss walking on them. Trampling on art was just not something I could wrap my head around, haha. Thankyou our sister Dana for providing a place of peace and beauty. Our stay there can be likened to a sabatical – a place to exhale… Thank you fun and delightful Ranvir also, for your hospitality and for an unforgettable meal at your gloriously lush ITC Hotel! Shirdi, Wai, Datta Tapovan, Pune and Dubai to follow in the next blog. Three albums were released~ Fragrance of Devotion, M and Mohanji Gayatri Mantra. These CDs are a collection of Aartis and Bhajans; written, composed, and sung by Mohanji’s devotees, expressing their deep love and gratitude for their beloved Master. 2nd June 2013, was marked as a memorable day indeed for the entire Bless The World family. The launch of first ever music album sung by the devotees of Mohanji, expressing their deep love and gratitude towards Him, which otherwise is so beyond words. The journey began when during the Power of Purity meditation in Muscat, Nandita Singh, one of the BTW members (resident of Gurgaon) saw a vision of many people performing Aarti of Mohanji. Nandita kept this to herself on that day. Next day when she visited Mohanji again, Mohanji said “Aarti has been written by someone and is in Pune.” Nandita understood the message. The vision was then shared with others, and then there was no looking back. ONE STEP TAKEN BY A DEVOTEE WAS SUPPORTED BY THOUSAND STEPS OF THE MASTER. Nandita Singh receiving a memento of appreciation of Inherent Selflessness from Mohanji. A shining example of In deep devotion and faith in Mohanji, she single handedly encouraged all untrained singers, music players and lyricists and produced these three albums!! A much deserved memento! He paved the path and showered guidance at every step from there on. Within next 24 hours Harshini, another devotee had the Aarti written. This was unexpected for our human minds. Yet Grace and the devotee’s devotion failed the mind. We all then started looking around for singers and musicians. Word was spread over. But Master didn’t want to wait! Within minutes of spreading the word, one devotee ‘happened’ to visit Shirdi Sai Baba temple at Lodhi Road, and her attention was taken straight to the singer performing there. She asked him, and he agreed to sing the Aarti. NO DELAYS! The first Aarti was sung and recorded over the mobile phone! Master’s plan had started to take shape in front of our physical eyes. This first Aarti created ripples in the hearts of many, and touched the devotion unexpressed in them. Looking back it seems this Aarti triggered many devotees and gave them the way and opportunity to express their otherwise indescribable love for their Master. All stored emotions oozed out and took shape of many more Bhajans. The GLOBAL BTW family came together; Master was simultaneously working through all. HE became the lyricist, the musician, the technician, the coordinator and even the producer. Suddenly all were empowered and one could just step aside and see the flow of this phenomenon in complete awe. Bhajans started to flow in from across the globe. Now we needed a professional studio with musician. This was meant to be much bigger than we thought. It was not just one Aarti, but a collection of many Bhajans, and definitely not just one CD. Our list of Bhajans was extending with every passing day. We soon found a recording studio. Aartis and bhajans were recorded again, with lot of rehearsals and in professional supervision. Before we knew we were working on almost 3-4 CDs, including CDs in Mohanji’s voice. He graciously accepted our request of coming to the recording studio and gave His voice to chants. The CD is in the making. Mr and Mrs Ranjan are not professional musicians but the feeling in their bhajans and aarti’s were so strong that it touched each and every heart present there. What was next! THE LAUNCH of this ‘phenomenon’. These CDs are a collection of Aartis and Bhajans; written, composed, and sung by His devotees, expressing their deep love and gratitude for their beloved Master. The guest of honor was Mr. Dipak Haksar, COO of ITC Group. The singers shone with bhakti by having live performances and Mohanji Himself gave satvic prasad from Madhuban to all. The event was further graced when Mohanji presented Mementos of appreciation for inherent selflessness to all the volunteers. It was a day of immense love, grace and celebration for all. The day ended with million smiles, love flowing in every heart, and a deep sense of gratitude, however the events of the day tried their best to deviate us from it all. This was a special event, first of its kind, for every member. The entire family was working as ONE to bring it together. Be it the production of CDs, preparation of venue, organizing the prasaad, or managing the event on the day. Few members got together even a night before to prepare the small packs of incense which were given to the people as a small token of ‘fragrance of devotion’, to label the CDs, to run through the list of ‘to do things’. It felt like a wedding in the family 🙂 The morning of 2nd June started off well, the venue was dressed and decorated with flowers, musicians came, volunteers were all dressed in Indian attires adding to the flavour of the evening, singers rehearsing, with Master’s pictures in the background. The entire ambience was only to be felt, HE was in every atom in that moment, so visible. Then the physical form arrived, Mohanji reached the venue 30 minutes before the scheduled time. From our experience of organizing events in Delhi, we knew there was a reason to this, too. He quietly went into the library of Sri Ramana Kendra (the venue) to wait for the event to start. People were walking in, volunteers welcoming them with tilak and a small pack of incense. All were seated, eagerly waiting for Mohanji to enter the main hall, when JUST THEN WE HEARD SOME BLASTS. One after the other and we had a sudden power cut at the venue. And then we witnessed one of the most amazing things of the evening, NO ONE PANICKED ABOUT HOW THE LAUNCH WILL HAPPEN WITHOUT ELECTRICITY. Everyone was calm and composed, and certain that the live performances will happen as scheduled without microphones, audiences will sit without fans and air-conditioning in the Delhi heat. And just then Mohanji announced that we will go ahead without the electricity and WE DID! Master has His own ways! With this incident, we cannot even comprehend what He removed from so many of us. His ways are beyond our minds, all we can do is have FAITH, Surrender to His Divine sports and allow ourselves to flow. Launch evening was the perfect example of this. A historic event! Mohanji lighting the lamp, inagurating the Album Launch. Even without the electricity we had the most beautiful evening of Devotion. Devotees sang from their heart, which needed no microphones and speakers to reach the heart of others. About 60 people took turn to perform Mohanji’s aarti, with loud singing from hearts, high beats of claps with tabla and harmonium, we all experienced an indescribable HIGH. Mr. and Mrs. Ranjan – Composed and sung Bhajans for ‘Fragrance of Devotion’, share one of their many experiences. I was driving in my car to office, one and a half hours drive from my home in Gurgaon, when there was a strong urge to write and sing a Bhajan for Mohanji. Sitting in the back seat of the car, my eyes closed, it was as if words started filling me. In just a matter of 30 minutes the words for the Bhajan were with me. I have never in my life written even a poem what to talk of Bhajan of three stanzas but here it was – ‘Hum Sabke Ke Pyare Mohan’. 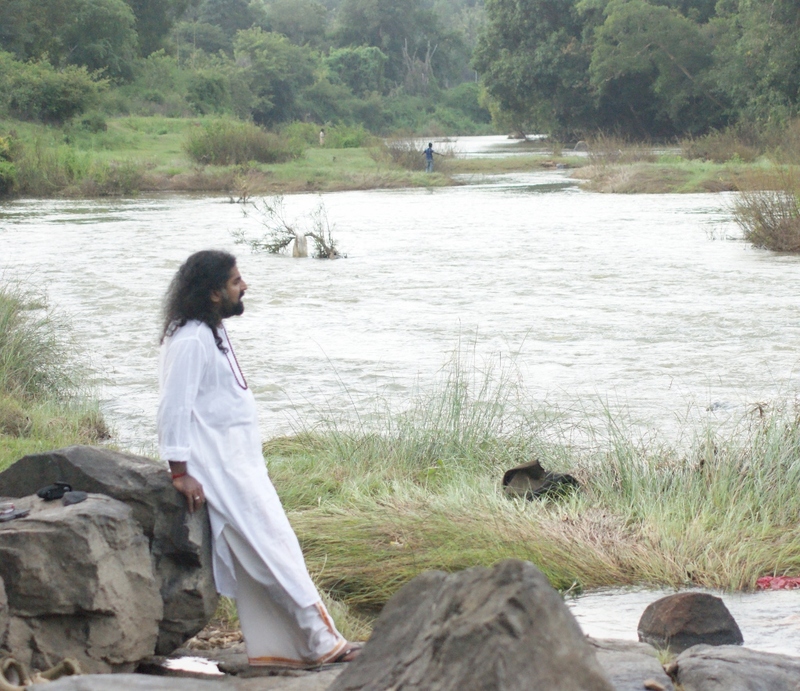 I instantly knew that my desire was given words by some divine power – who else could it be but Mohanji Himself! I had an old Hindi Bhajan and I found that the words given to me were fitting beautifully to that. I discussed with my wife Vibha and we decided to sing it. We thought the song came out quite well and we were eager to present it to Mohanji. Nandita then informed us that a CD of Aartis and Bhajans is being planned but that the music should not be a copy of any song; and it should be original! She then said just take Mohanji’s name and try new original music and it will come! Neither me nor Vibha are music composers nor we have that in us. But on being coaxed by Nandita we sat with the harmonium and there was an absolute miracle. The music flowed and in less than 5 minutes the Bhajan in its present form was before us! We were totally overwhelmed with emotions at Mohanji’s help! It was a exhilarating experience to sing the Bhajan live in Mohanji’s Divine presence on 2nd June at the launch of the CD at the Ramana Kendra. Arihant Gupta – Singer and Composer for the Album ‘M’, shares his journey of the making his debut album. There is so much to tell about the experience of working of our father Divine Mohanji with me that one finds it difficult from where to start. But I would like to start right from the beginning. Our group of BTW family members in Jammu started our journey to Kud ‘Mohanji’s Dham’ in J&K by passing through Udhampur, as Mohanji had to meet the children in ISKCON temple there. 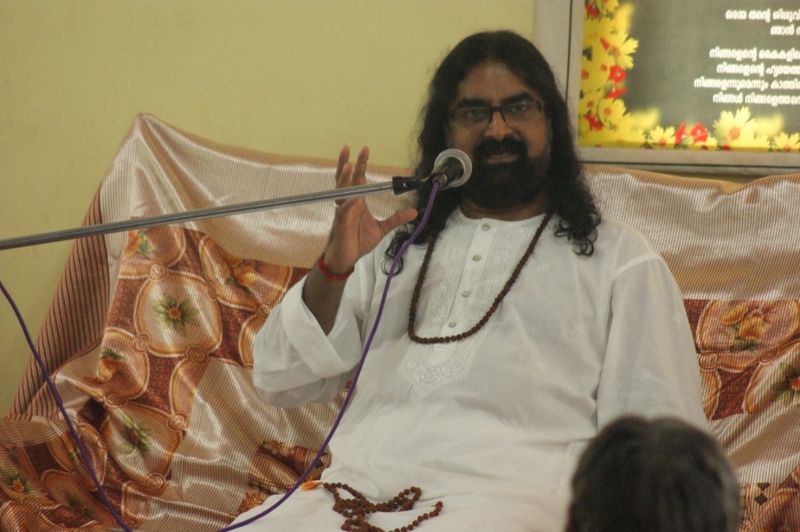 I had decided a long time back that I will seek my Guruji’s opinion regarding my deep interest in music so that He suggests me which path to follow, as my efforts were useless otherwise. Finally when we reached Kud and were sitting with Him next morning I got the opportunity and I told Him. To my surprise Mohanji’s response was so quick and positive that without even thinking or testing me for once He straight away asked me to create an album of devotional songs for BTW family and most importantly He had so much of faith and confidence in me about my capabilities which no one had, not even my own parents. Even though they always have been a big support but they also feared if I would be able to handle such a huge responsibility. I was overwhelmed with happiness and the confidence my Master had in me. He also mentioned that in SIX MONTHS time the album will be finished and launched. Then every bit of detail, like number of songs and title of the album, source and matter for lyrics etc. were automatically taking place in the same manner. From there started the journey and Birth of “M”. I had my own bit of doubts that how everything will go and take final shape. But since my Master had so much of confidence in me I became fearless and started working on the album. I wrote the first lyrics and then composed my first song ”O gracious one” which gave me inspiration to work further. Despite such a busy schedule with my studies, I was working on this album with a lot of interest and many creative thoughts started knocking at my door. It was clearly visible how Master was working through me and managing everything. I would also like to mention that whenever my thoughts were clear and surrendered to Master only then His Grace would flow in me. At times when mind was occupied and I felt as if I was out of connection with Him, doesn’t matter how hard I tried nothing happened. It was only when my heart was clear and thoughts channelized that music, lyrics and different compositions came within me. Subtle beings always feel divinity easily …and are happy to take His blessings always. One of the most astounding of all experiences was of composing of “Hare Krishna“. We had come back from Kumbh Mela and I had a strong feeling that something really big has to happen. The very next day as I was sitting in my room alone after dinner and trying to sleep, suddenly a thought to play guitar came in my mind. The lights were all off and as I connected with Mohanji and started strumming on my guitar something out of the world happened. I started chanting Hare Krishna, which had completely taken over me during Kumbh Mela and with my eyes closed I first experienced white light. The words and chords automatically started flowing and so did the framing of song structure. It is hard to believe that the whole song was composed and designed in just 15 minutes, which is impossible as compared with the quality of the composition formed. I was speechless and in a state of complete bliss!!! Then came the time of final exams in college and I still had five more songs to work on. I started getting restless and a bit hyper as to how the things will go further. But with my faith in Master, the things went so easily, comfortably and beautifully. Finally the composition part was done and now we were left with recording the Album in studio, but unfortunately I fell sick and was hospitalized. Constant thoughts of completing the album were always on my mind. There also with divine grace of Mohanji I recovered so quickly, that everything happened on time once again. Soon we started with recording of my vocals and guitar. Since time for producing the CDs needed at least 5 days, we were running short of time. But with Mohanji’s grace and His presence all the time we were able to give music to all 9 songs in just 18 hours. On last evening I and Guna (our studio guy) started at 1pm and completed the work at 6am the next morning. I still remember that even after working the whole night I had so much of energy in me that I was completely fresh without any urge to sleep or rest. As Mohanji was in Delhi at that time, I went to meet Him after completing the work. He had just taken his bath and came out the room, we both had an eye contact and smiled. He, with such humbleness and simplicity, asked me, ‘how did it go? Are you satisfied?’ I was overwhelmed with happiness, wanted to tell Him everything I experienced, but His smiled conveyed that He knew already. My father told me once that I and your mother may not be there with you forever but one thing you must know, that you have your divine father Mohanji is with you and will always be there with you forever. 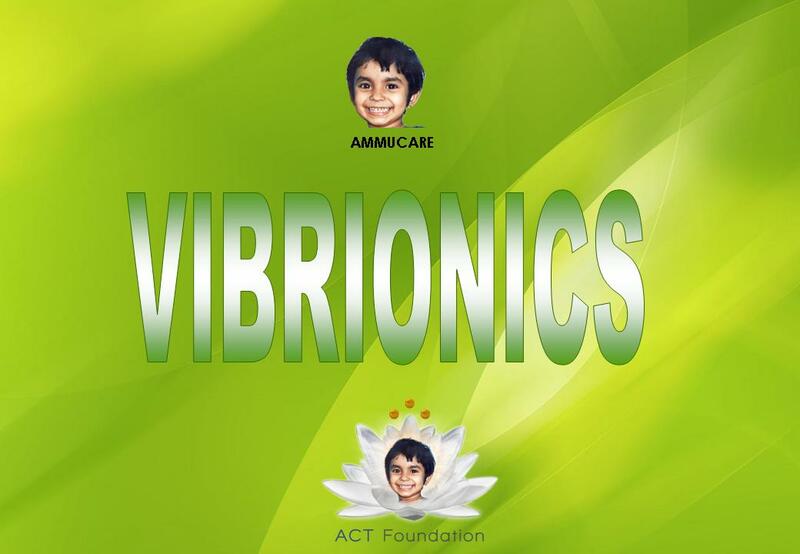 We were gifted with a journey with a purpose, to make firm first steps in reviving vibrionics. I’m infinitely envious of writers. To take words – know how to arrange them, to convey with ease what they want to say – and to make it sound like music. Nothing less will really do when we attempt to express concepts such as ‘love, divinity, agony, death, bliss, catharsis’, etc. What to say about sitting in the company of Saints – and knowing absolutely, that They see everything that is inside of you, and it’s beautiful, and you WANT Them to see it all – your beauty and your filth….all of it, and its okay; its naked but safe. In those merciful encounters, you know that none of it is real, none of it matters, there is NO-THINGNESS and NO SEPARATION. How on earth can that be verbalized? These and all the other incredible moments, we were gifted by our Guru Mohanji who sent myself and Hein on a journey with a purpose. Mohanji’s compassion is overwhelming and one of His many passionate initiatives is to bring health care across the globe to as many as possible living beings that do not have the luxury of decent or any healthcare. We went to India to canvas for people who are drawn to serve those in need. We need folks to study Vibrionics Healing, a potent yet natural system of healing, and establish free clinics in the areas where the need exists. A separate blog will be written, focusing on the Vibrionics presentations in more detail. I’ve had the unbelievable grace to have been at the feet of two enlightened Masters in this one lifetime. A divine collaboration now exists between these two Masters, Mohanji (BABA) and Mataji Narayani. 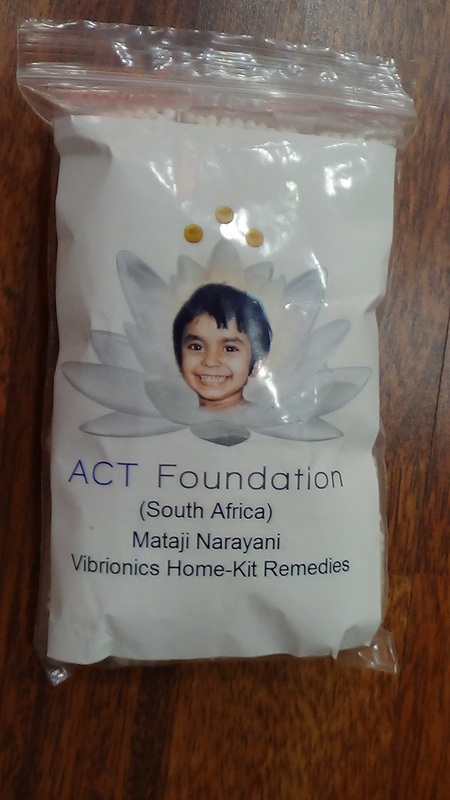 Although only Mohanji is in a body, They are working together to orchestrate a major revival of Vibrionics, Mataji’s life’s work, and Mohanji our beloved Master, is taking Vibrionics to a global level. Mohanji’s compassion is overwhelming and one of His many passionate initiatives is to bring health care across the globe to as many as possible living beings that do not have the luxury of decent or any healthcare. 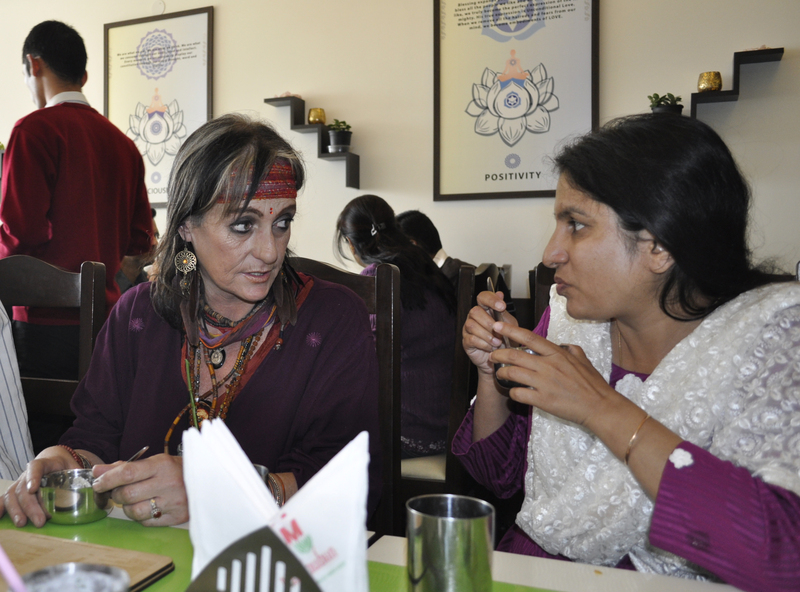 I have a great need to speak about the folks of India that we met. Due to my not-so-good memory, I’ll avoid dates and make an infantile attempt to speak about the amazing people we met in India. So we arrived at Delhi airport, and as we pass through the first glass doorway, a beautiful young woman says: “Do you recognize me?” Lovely Amita, how could we not recognize you? We flew through all the airport red-tape and watched Amita in action – intimidating, haha! We then (with great anticipation for me), were met by quiet, almost regal and graceful Nandita Singh, who also hosted us in her beautiful home in New Delhi. Then, lo’and behold, she quietly, put a beautiful wreath of bright orange flowers around Hein’s and my necks. We felt like royalty – the two “nobodies” from South Africa! What an entrance into India! At Nandita ji’s beautiful home, we gradually met all Mohanji’s children. There was efficient and wonderful Shashank, who is so handsome, he needs to only stand and look aesthetic, I would love him anyway – but Shashank is so much more…and loves Mohanji absolutely. 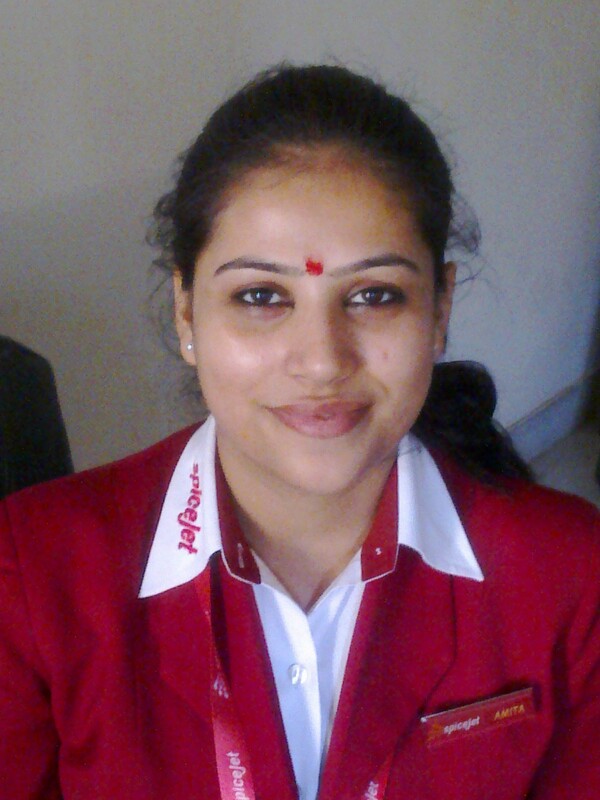 Then there is Shreya, quiet Shreya – ultra intelligent and so well read. Shreya with the passion for English Literature. She and Hein had much to talk about, two bookworms and compulsive readers. A spontaneous discussion on authors and books ensued at the dinner table! Bilja, our sister from Serbia. 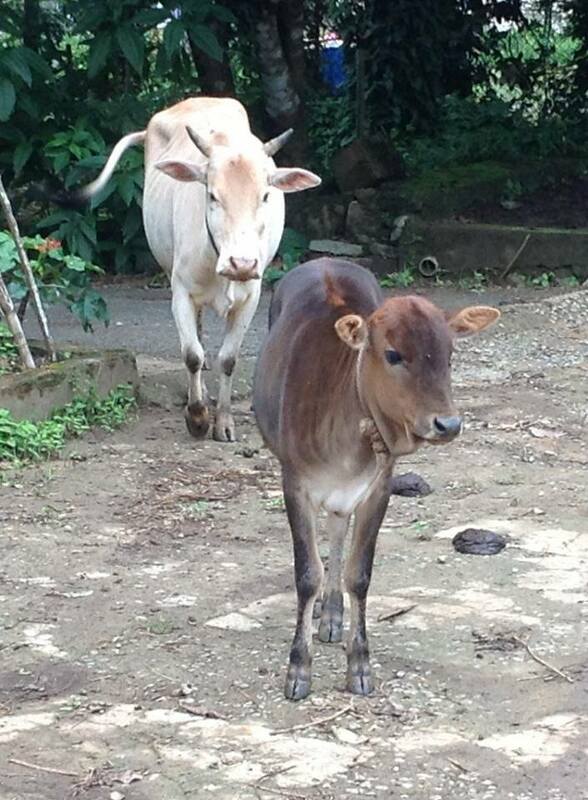 Bilja is our “zero tamas” family member, she has a will of steel and is exceedingly disciplined. She was efficient and also ready with the camera, admin duties etc. an example to us of no procrastination. 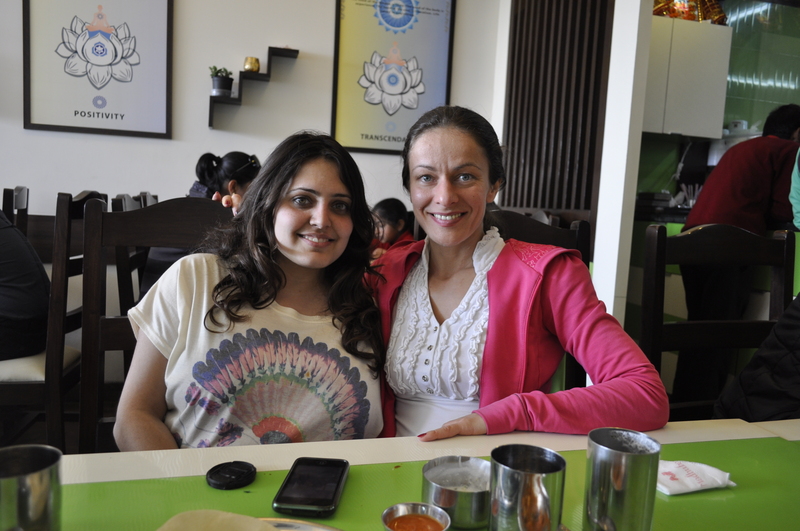 As for Daina from Latvia (who was always cold, haha), we immediately bonded when she also arrived at Nandita’s home, I immediately knew she was pregnant, she had that blushing hue on the cheeks, so beautiful yet so subtle. We move on to big-hearted Bharti Kapoor who takes everyone under her wing! I also met her gentle daughter, sweet like her daddy. Bharti with the family of nine people in the house. Bharti who arranged a pain injection for me within 15 minutes – doctor coming out to the home for goodness sake! Never seen in South Africa, that’s no maybe! Bharti with the gentle husband and daughter whom I had the privilege of meetings also. Because laughter is such medicine for me, I particularly enjoyed Palak and Aparrna. Palak-with-the-eyes, a humoristic, fun and loving predisposition and so full of fun, yet so gentle; she is too lovely also. 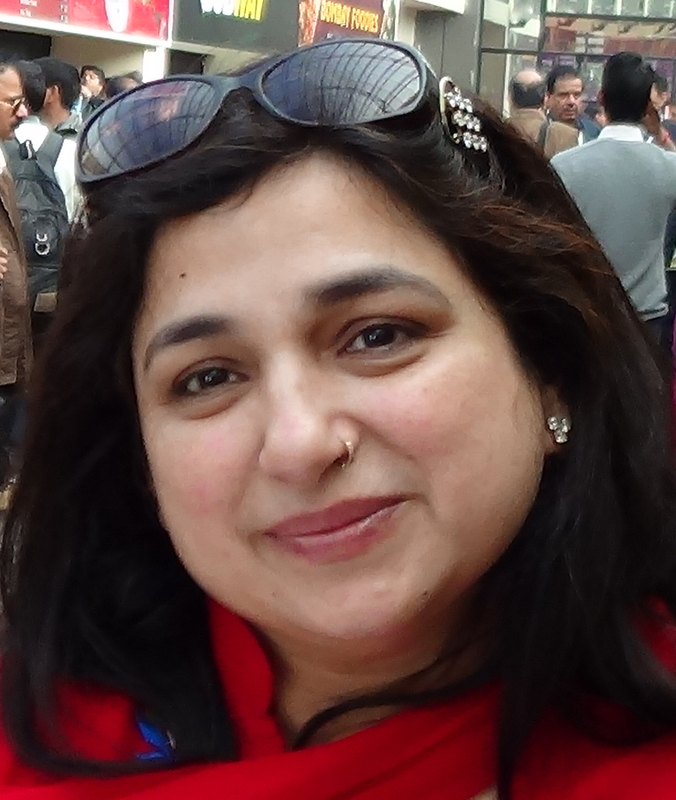 As for our author/journalist Aparrna, now her I enjoyed for her absolute unedited honesty and her lack of inhibitions or pretenses; a sheer delight she is and hilarious! Nandita ji’s home was our home, and a little piece of my heart was left there too. Nandita is one of our Vibrionics students in Delhi, and I have a very strong feeling that she will play a key role in our Vibrionics initiative. I foresee her clinic to be one of the training centres for practicals after students have completed their studies. Shashank and Nandita making a plan. Nandita is going to be a key person for vibrionics in India. There were many more amazing folks that we met – handsome publishers, surreal and exotic looking authors and many more. 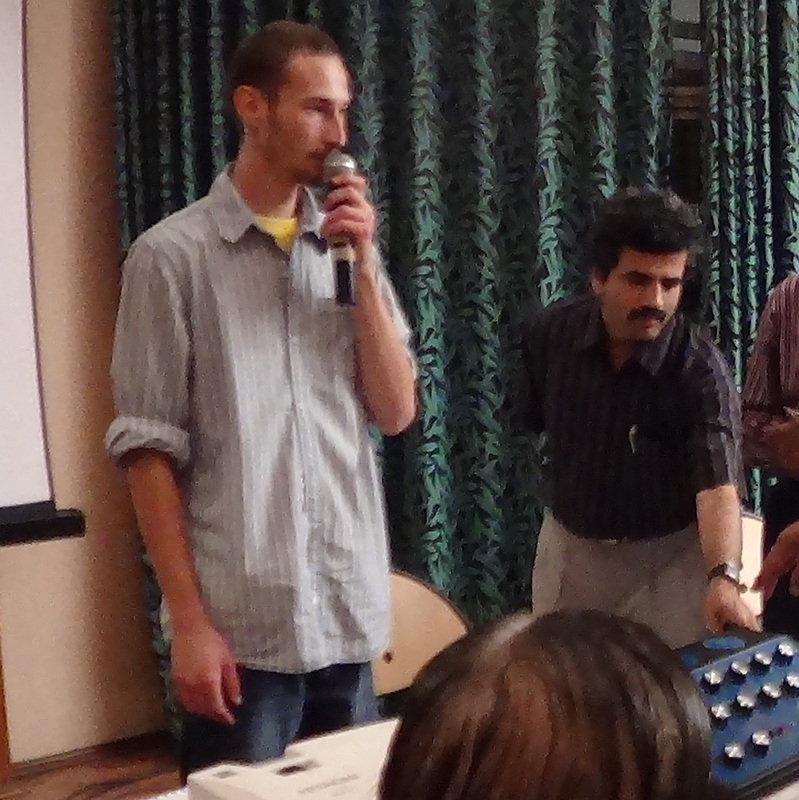 Shashank and the Delhi team arranged 4 Vibrionics presentations for us in Delhi. Everything was beautifully organized. I marvelled at their teamwork and the light and loving vibes between this team! 1. Our first presentation was at a University in Delhi. I called up from the audience, a beautiful young boy/man, for the purpose of demonstrating the use of the pendulum, and to demonstrate how a diagnosis is done. The young student told me that he had a horrific temper over which he had no control. I looked very deeply into his eyes, and saw no anger there, only tremendous heartache and feelings of inferiority and rejection. The pendulum confirmed this. I told him that his weeping heart is protecting itself by manifesting the emotions as anger. If this boy was my patient, I would have given him the beautiful remedy called ‘Ignatia’ – which is THE remedy for grief. I would have added our love ‘Shock Mix’ and that would have been that for medication. The rest of the cure lay in loving and validating him as a beautiful and accomplished being, with tremendous potential. Dear Shashank was there, doing all the translating for me. 2. We were taken to a home for elderly ladies who’s families weren’t or couldn’t take care of their elders. For me this was a particular privilege – I so deeply respect the ones who’ve live entire lives and have seen and learnt so much. I had a feeling that some of these elderly ladies might be perfectly capable of doing the Vibrionics course and rise to the occasion and I told them so. Suddenly, after the talk, the old ladies started qeueing up to tell me about their aches and pains. Desperate for medicines but even more desperate for someone to listen and take an interest. I had to explain that we didn’t bring sufficient stock to treat people – it was a sad few minutes for me, and it confirmed the need for love and decent healthcare! 3. We then spoke at a school for young girls who come from abusive homes, some of them orphans). We did our presentation, and afterwards, I hugged each girl breathless in my loudish South African way. What was profound in this presentation was the obvious realization that some of these girls have not known much hugging in their little lives. A few of them had tense almost fearful little bodies, and needed to be coaxed into relaxing into an embrace. Yet all in all, there was beautiful interaction and much laughter mixed with me choking back tears. I painfully realised that some of these girls were not used to motherly love and hug. 4. The 4th presentation in Delhi was at the Ramana Kendra. There we had a very responsive intelligent group of people, and so responsive, it was a delight. We met with my facebook friend, Wing Commander Sharma and his charming wife Dr Manju Sharma. Hein particularly enjoyed one-on-one interaction with the Wing Commander. Nandita ji was at her post next to me, and took a load off me after the presentation, when we had to mingle and answer people’s questions. 5. The 5th and final presentation in Delhi was at the Ghandi Place. It was early morning and pretty chilly, but the people came despite that. An elderly gentleman (close on 80 years of age, was sitting comfortably in a full lotus position. We commented on that, and before we knew it, he was performing some intricate yoga asanas, agile as a youngster much to our delight! He, I’m sure, will also do our course. A lovely soft-spoken young man (I so wish I could remember his name), came forward for a diagnosis. Every person that comes to the podium for a diganosis, is first subjected to my hugs and cuddles. I have to say again, love and compassion makes up 50% of the healing that happens!! Anyhow,there was such love flowing, that from his pocket, this young man gave me a ‘meditation’ stone and a crystal as a gift. I was deeply touched and later asked Mohanji to bless both these heartfelt gifts. I have them at my altar, next to Mohanji’s Paakukas now. Out of love and the desire to make our time in Delhi profoundly wonderful, we were taken to the astonishing Aksha Dharm Temple with sculptures and murals that send a fellow artist like myself, into “artistic heaven”! A surreal light and water show, concluded the visit to the temple and will remain etched in the memory forever. I would like to end my musings on Delhi by relating an experience at the Shirdi Sai Temple next to Ramana Kendra. We had just completed the presentation at Ramana Kendra, myself, Hein and Mohanji’s whole family of devotees went to the Shirdi Sai Temple. Now, to find the words….. We entered the rather busy and buzzing-with-people Temple. So this was Delhi – this was my amazing time with people that are now lodged deep in my heart, where I’ll nurture and embrace forever, the unconditional love received. Of course, behind it all, there is our beloved Master Mohanji (BABA), who orchestrated every moment of this profound experience! 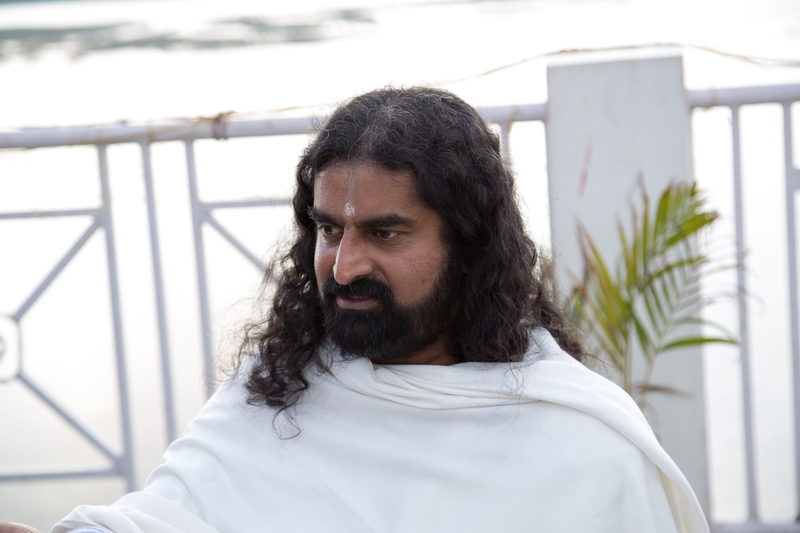 Blog on Rishikesh, Mumbai, Bangalore, Shirdi, Datta Tapovan, Pune and Dubai to follow.